Review date: 8 October 2006. I have held forth about the wonders of buckling spring keyboards on previous occasions. For the benefit of new readers: They're great to type on, they're extraordinarily durable, and they make two clicks per press of a key so you sound as if you're working twice as fast as you are. The clicks don't, actually, have much to do with the switching mechanism itself. 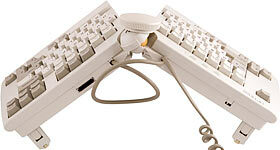 The first buckling spring keyboards were capacitive units, in which the keyswitches are non-contact devices. When you press a key, it moves a plunger that's part of a little capacitor, and the control hardware detects the change in capacitance and sends a keypress message to the computer. Capacitive keyboards of one kind or another were quite popular back in the mists of time, but the complete absence of a mechanical keyswitch mechanism meant they also had absolutely no innate tactile feedback at all. When you're typing on a basic capacitive keyboard, you can neither feel nor hear when each keypress has registered. This means that fast typists either make a lot of errors or push the keys really hard and ruin their hands. 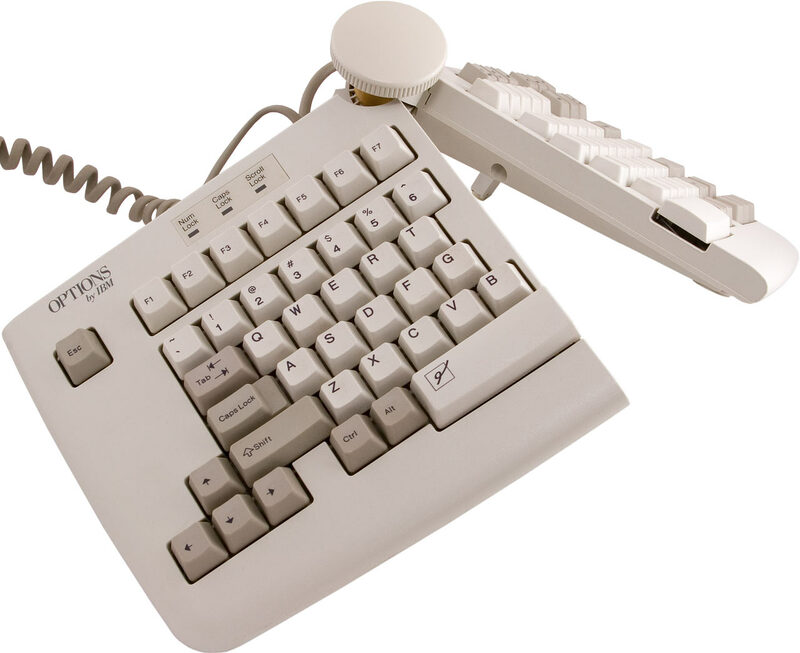 So a number of different clicker doodads were added to capacitive keyboards to make them feel more like the ingenious electromechanical keyboards that many of the world's typists were still using. One of those doodads was the buckling spring, which is what it sounds like - a minimally contained spring that, because it has room to move in the tube in which it's installed, compresses a bit and then buckles like an inchworm when it's compressed far enough. When the spring buckles, you can both feel and hear it. 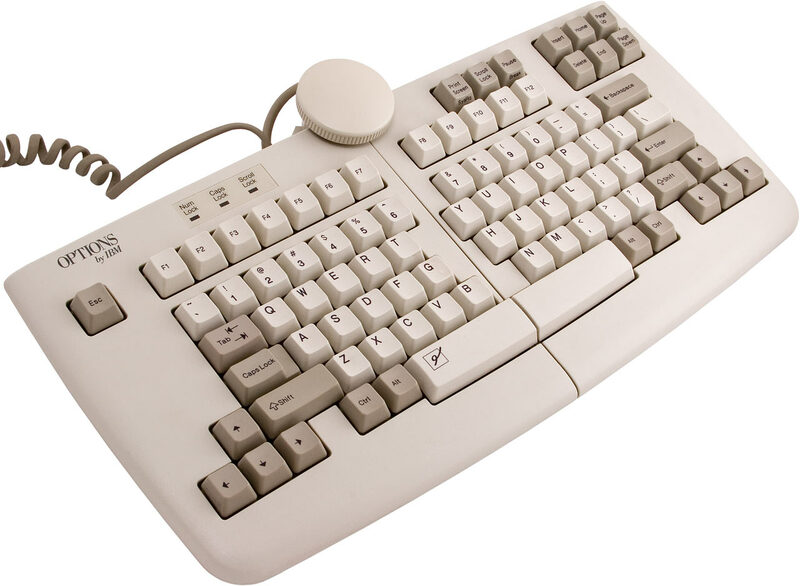 Provided the keyboard is well enough designed that the click actually coincides perfectly with the amount of key throw needed to register a keypress, the result is a keyboard that's a joy to use. Virtually no "clicky" keyboards today use capacitive switching. Most of them, including the IBM ones that're most common and about which I've written so often, use a membrane design. This is rather surprising, because membrane keyboards are, beyond question, the second worst keyboards in the world. Roll-up rubber keyboards that feel like typing on stiff jelly? They're better than membrane. Chiclet keyboards, as seen on various ancient cut-rate home computers? Also better than membrane. A pure membrane keyboard, you see, has no keys. It just has a sandwich of two plastic membranes, which are buttered with conductive traces on their facing surfaces. The tempeh patty in the sandwich is a thin insulator sheet, with holes in it to match the position of each "key". When you press a "key", you press the membranes together through a hole, complete a circuit, and that registers a keypress. Membrane keyboards are cheap and, if made properly, very reliable. They also present a flat plastic surface to the world and are thus about as hard to dirty and easy to clean as any keyboard can ever be. That's why so many microwave ovens, for instance, use them. For actual typing, though, I suppose a membrane keyboard does beat having no keyboard (or almost no keyboard) at all. But it's a close-run thing. 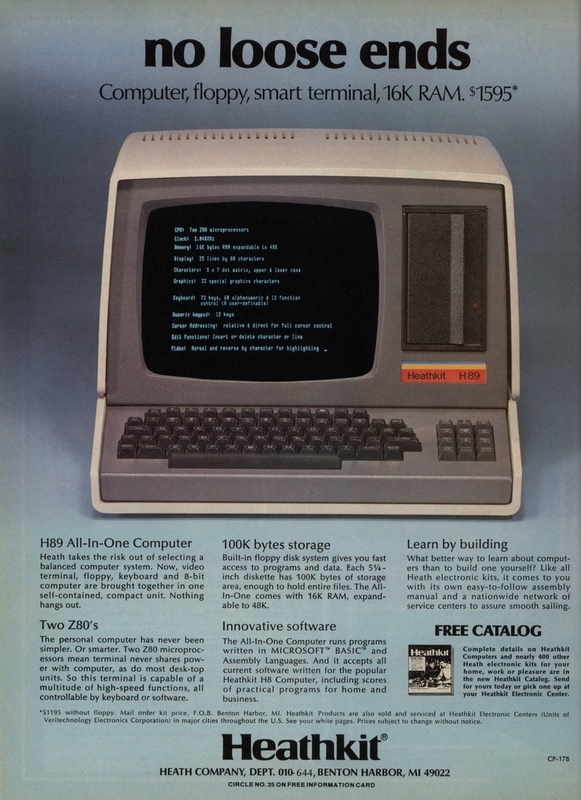 Some people, may God have mercy on their tendons, wrote thousands of lines of code on the Sinclair ZX-81's d0rky keyboard - though the real hackers connected a proper keyboard to even that $US99.95-in-1981 computer. Anyhoo, the way to make a membrane keyboard usable is, as with capacitive keyboards, by putting some sort of nice-feeling mechanism over the top of each membrane pseudo-key. The user presses the mechanism and gets pleasant tactile feedback from it, and the mechanism presses the pseudo-key. This is how every ordinary keyboard these days works. 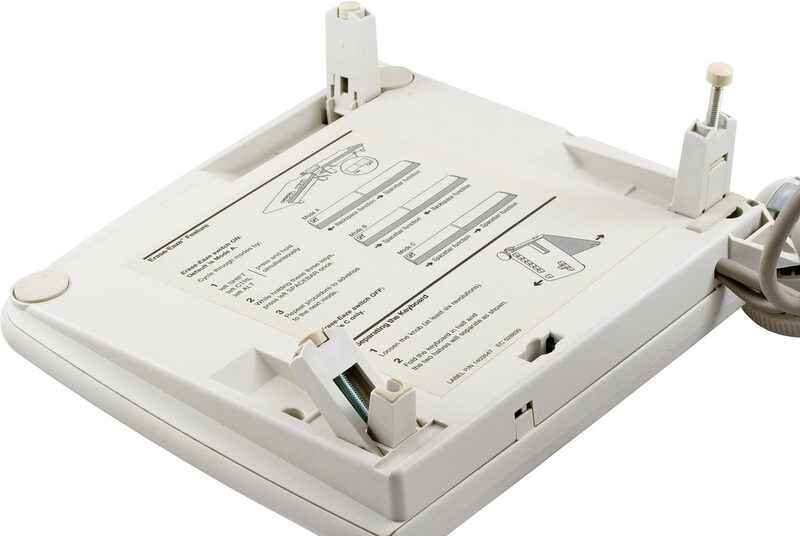 The "rubber dome" mechanism used in desktop keyboards and the "scissor" mechanism used in laptops are just different ways of putting some kind of tactile springy thing on top of a membrane. And this, patient reader, is also what happens in a "buckling spring" keyboard. It just feels nicer and makes more noise. The spring buckles, its base tips a little see-saw hammer thingummy, and that presses a membrane switch. The above-linked page also shows the innards of an old "Model F" capacitive buckling spring 'board, by the way. 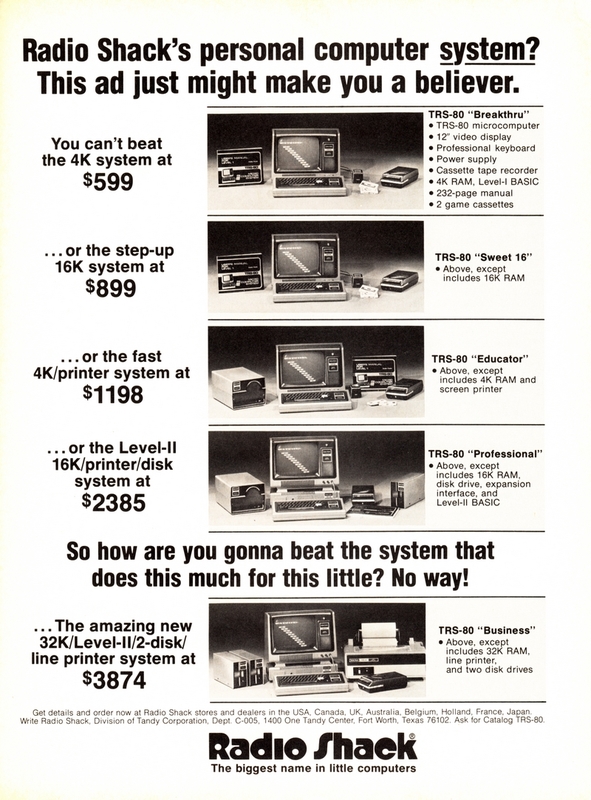 You can forget about using the really early Model Fs with a PC unless you apply some serious ingenuity to converting the interface standards, or get an XT 'board and then drop significant money on an interface adapter. 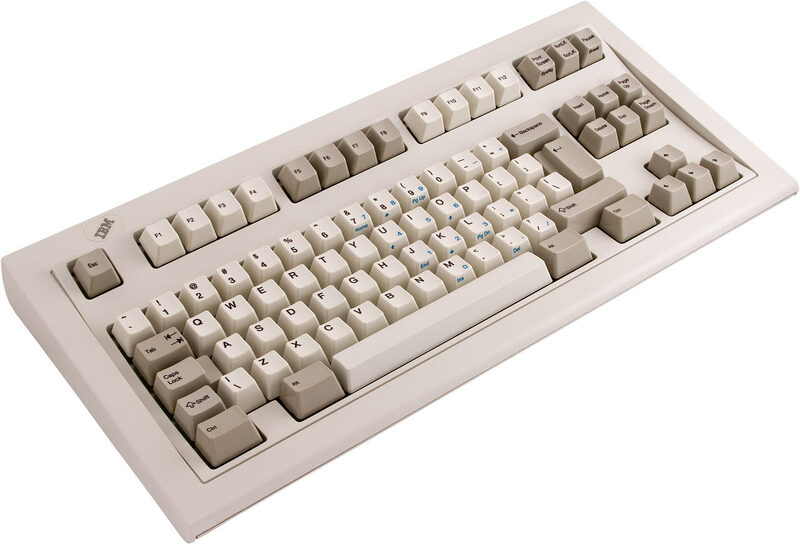 If you're crazy for no-numpad old-schoolness and aren't getting an XT keyboard for free, then it's much cheaper to get an AT Model F. You should be able to plug that into a PS/2 socket with a simple pin adapter. All this brings me, once again, to Clicky Keyboards, leading retailers of refurbished and new-old-stock IBM battleship keyboards to the cognoscenti. It's not hard to buy a clicky keyboard, if you're not picky. Used buckling spring and Alps-keyswitch boards are traded pretty briskly on eBay, and they still turn up in offline auctions, junk shops and even dumpsters from time to time. If you'd prefer a standard clicky keyboard of recent manufacture in a box, then you probably want one of Unicomp's products. Their basic models start from $US59 (for the no-Windows-keys version, which many people prefer...) plus shipping. Shipping won't be cheap for shoppers outside the USA, but whaddayawant; a clicky keyboard in a box weighs more than five pounds. If Sir requires something a little... unusual... however, Clicky Keyboards are the place to go. And they've been good enough to furnish me with three more examples of their more peculiar products. This imposing object is a model M13 industrial TrackPoint keyboard, made by Unicomp in 1999, part number 06H4173, currently selling for a mere $US75 (while very genuinely limited stocks last...) plus shipping. 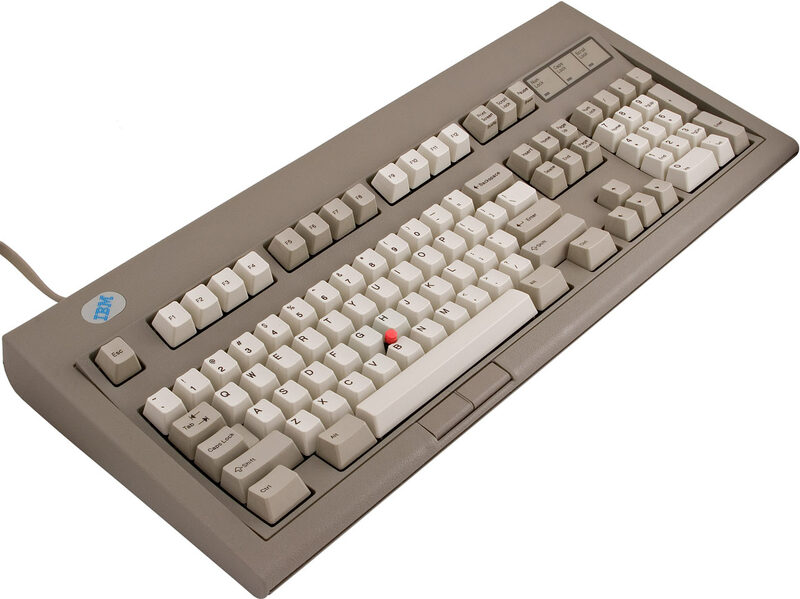 There's nothing really specially "industrial" about the construction of this keyboard; all model Ms are suitable for driving nails, so IBM didn't bother adding anything much to the design for this version. Apparently it's got more drain holes inside, but that's about it for the substantial physical changes. According to my NIST-calibrated $30 digital fish scale, the M13 weighs a burglar-thwacking 2.06 kilos (4.5 pounds) including its cable. Ordinary keyboards these days often weigh in at considerably less than a kilogram; I just weighed a plain USB 'board and got only 0.7 kilos (1.5 pounds) including cable. But two kilos is normal for Model Ms. In a game of keyboard conkers, they're the product to choose. The Industrial 'board does, however, diverge from the standard M pattern in that it gives you an integrated pointing device, as with the black TrackPoint keyboard I checked out last time. And the Industrial 'board also has a funny coloured casing around its standard-coloured keys. Exactly what colour the casing is, is difficult to say. Clicky Keyboards say it looks more like "olive drab" than the quoted "industrial gray" to them, but it's not actually nearly that green if you ask me. I had some trouble colour adjusting the pictures of the thing; it does look kind of greenish-grey, but I'd need a calibrated light source and colorimeter to be sure. It unquestionably does look different and serious, though, which is the main thing. And, more importantly, there's the TrackPoint. 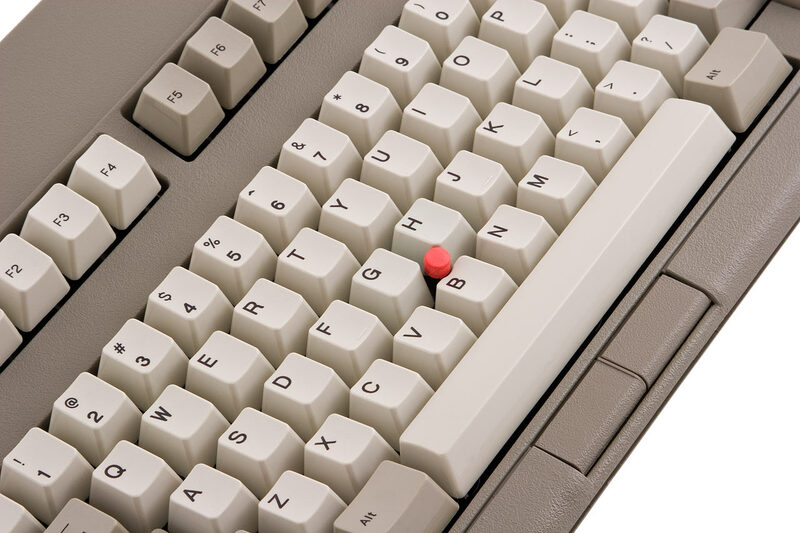 This is not the usual kind of TrackPoint, as seen on zillions of IBM (and now Lenovo) laptops, and also on the black TrackPoint Model M. Those TrackPoints use a strain gauge to tell how hard you're pushing and in what direction. Strain gauge TrackPoints hardly actually move at all. This TrackPoint, in contrast, apparently uses a Unicomp "force sensing resistor" design, which means the little joystick has an easy couple of millimetres of actual travel in every direction. This means it rubs up against the surrounding keys a bit. It's also a bit taller than a TrackPoint usually is, so it stands slightly proud of the keyboard around it. I'm quite used to ThinkPad TrackPoints (I prefer them to touchpads, but in my limited experience touchpads seem to keep working forever, while TrackPoints wear out...), so this taller and more wiggly version bothered me at first. It didn't take much practice for me to get used to it, though. It's no better than any other TrackPoint; woe will be you if you try to use it in action games, and probably also Photoshop. If you hate "pointing sticks" in all their incarnations, then you'll hate this too. But if you don't mind pointing sticks, this one shouldn't be a problem. Oh, and its buttons, down on the front edge of the keyboard, are virtually silent. Typing's as noisy as ever, but mousing doesn't make a sound. According to Clicky Keyboards, you get four TrackPoint caps with your M13. This would appear to include the one that's already installed on the little stick, because the baggie with my M13 only contained three more. This is still a nice touch, though. 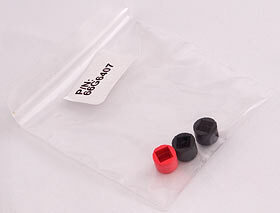 TrackPoint caps do wear out, and you even get a couple of black ones, in case you're not a red-dot kind of person. You don't, of course, have to use the TrackPoint in this keyboard at all if you don't want to. There's no reason to buy a keyboard with a TrackPoint in it if you never intend to use the thing, but if you'd like to set up a mouse as well and use the two alternately, that's easy enough. Easier than you'd think, actually. 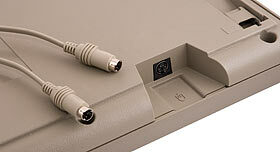 The M13 comes with the twin-PS/2-plug cable you'd expect, and you can adapt the plugs to USB if you like. Any old cheap PS/2-to-USB adapter is pretty likely to be OK, but Clicky Keyboards sell one and two port adapters that're guaranteed to work. 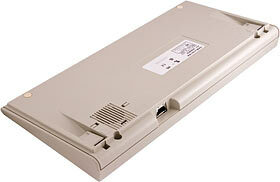 But the M13 also has a PS/2 mouse socket on the back. Plug a mouse into that socket and it works in parallel with the TrackPoint, so you can easily switch between the two devices at will, or even use both at once, which might I suppose be handy for people with limited mobility who'd like to mouse with one hand and click with the other. In theory any PS/2 mouse should work through the M13, but anybody who's played with vintage keyboards for a while knows that supposedly universal interface standards have enough variation that old input devices do not necessarily work right with new PCs. That's why Clicky Keyboards sell those guaranteed USB adapters, and it also explains why the first mouse I tried plugging into the back of the M13 didn't work. That mouse, mind you, was a brand new $5 Hong Kong Special that lights up blue when it's powered up. It lit up perfectly when connected to the M13 via the mouse's own PS/2 plug adapter (which is just a pin adapter, by the way - mouses that support two interface standards are able to speak both languages, and just switch between the two when necessary), but that's all that it did. So I tried an antediluvian three button optomechanical Logitech (whose manufacturers apparently may have been involved in possession or distribution of a controlled substance - rock on, Logitech!). That worked fine. The on-keyboard mouse socket is, of course, just a convenience feature. You can leave the M13's own PS/2 mouse cable unplugged and connect a mouse to that port on your PC instead, or you can plug in a USB mouse and get parallel pointer control that way. The M13's cable, by the way, is not removable. The studliest Model Ms have easily replaced plug-in cables. Why, here's one right now. This is a Model M space saver - an almost standard IBM battleship, but without the number pad. It is, accordingly, a mere 403-odd millimetres wide (15.9 inches), and weighs in at a sylph-like 1.8 kilos (3.9 pounds). 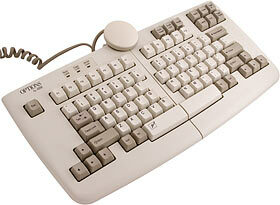 Clicky Keyboards sell nice clean used space savers, when they have stock, for about $US85 ex delivery. You won't find this keyboard in the standard space saver listing, though. It's in the new-in-box department instead, because it's actually a Unicomp product, manufactured only a couple of years ago. It's got the part number 1394054, and has 85 keys, instead of the 84 on the regular space savers (which are part number 1393278). That makes this keyboard particularly rare, so Clicky Keyboards are selling it for a hefty $US165. To cut to the chase: No, it's not worth the extra money, unless you're a collector. Get a basic $85 space saver instead. Even $US85 is, of course, more than you'll pay for the base model Happy Hacking "Lite 2" keyboard. The Happy Hacking 'boards are probably the best known modern space savers, unless you count all of those cheapo 'boards that use nasty laptop keyboard modules. But the HH Lite 2 is a boring rubber dome 'board, as is the more expensive standard HH model. The "Professional" Happy Hacking 'board uses superior capacitive keyswitches, but it lists for $US269. Most space savers, including the neat little "Deck" I reviewed a while ago, have a similar key arrangement to the Happy Hacking models. It's the same kind of layout you find in laptops, with the cursor keys and the nine keys that normally live above them cramped into the standard key block, one way or another. The Model M space savers leave the cursor keys and their nearby friends alone. IBM just sawed off the numpad. These things don't even have a Caps Lock light. This rare 1394054 variant has a slightly different layout from the standard cut-down Model Ms. The cheaper space saver Ms have a straight horizontal Enter key, but the 1394054 has a vertical Enter, with the backslash/pipe key, which is Control/Alt-key-sized on the standard M, shrunk to normal size and moved next to apostrophe/quote, and duplicated on the other side of the keyboard, next to a shrunken left Shift key. This extra key may come in handy if your preferred key-map uses it, but the extra money is a lot to pay for one lousy key, even if you've got a use for it. The space saver M has, in standard laptop fashion, numpad key markings printed on standard QWERTY keys, in this case in blue. The Scroll Lock key does double duty as Num Lock (there's no indicator light for those functions, either); press Shift-ScrLk and you activate numpad mode, with all of the blue markings doing their thing. This is a pretty long way from being convenient, of course, but we now live in a world of $5 USB numeric keypads, so you can always hook up one of those if you have to. Yes, the 1394054 has a plug-in cable, as do the cheaper 84-key 1393278s. The one I got for review for some reason came with these two curly cables, one short and one long. I note that Clicky Keyboards only promise the short cable. 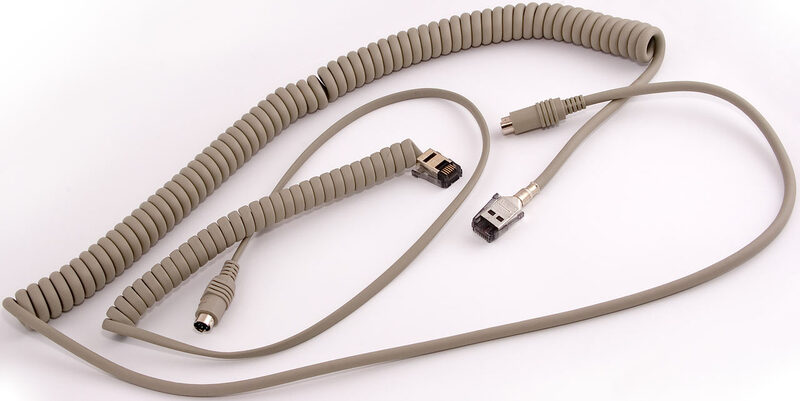 All of the plug-in Model M cables have the same connectors, though, so you can easily swap in a cable from any other scungy old M if you need more length. Or, of course, just use an extension lead. This thing may have been made in 2004 (it's five years younger than the latest 84 key space saver Clicky currently have to sell; it's seventeen years younger than the earliest one), but it's old school all the way, down to the 1.5 inch speaker grille on the underside. As has been normal for PC keyboards since the XT version, the grille is empty. No little key-click speaker lurks under it, and it serves no purpose at all. There's plenty of room in there for the guts of a little transistor radio, though; go ahead and make yourself a musical keyboard if you feel like it. This particular funny little 'board's one for the collectors, at this price. There's nothing at all wrong with it, and the Model M space saver design is a good one, even though it's clear that nobody strained his brain coming up with it. But you can get the same thing for less. It's nice to have a brand new 'board, but the famous durability of the IBM battleship means the cheaper used 'boards are a better buy. Who said clicky IBMs all looked the same? This is, for the benefit of less perceptive readers, an ergonomic split keyboard. It's got lower profile keys than a Model M and it's got an ominously... stylish... "OPTIONS by IBM" logo printed on it, not to mention some squiggly thing printed on the space bar. 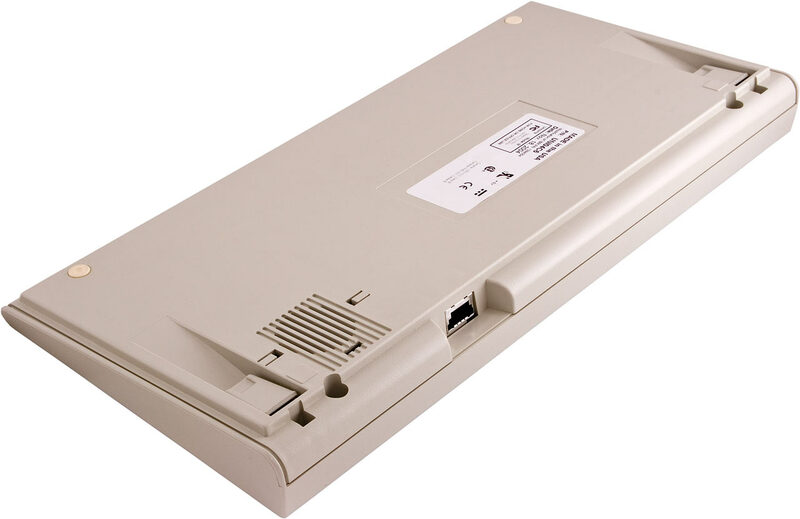 So the obvious conclusion is that this is, as far as its keys go, one of the entirely unremarkable rubber dome 'boards that IBM/Lexmark/whoever have been churning out by the zillion since the buckling spring left the mainstream. But no! This is a proper clicky buckling spring 'board! The keys are indeed flatter than those on a Model M, but they've got just as much throw, feel the same, and make just as much noise. This keyboard is, in point of fact, a Lexmark 13H6689, a.k.a. the model M15. It was made in 1994. And clicky Keyboards do not, as I write this, have any to sell. This weirdo is quite rare, but unlike the 85 key space saver, there's plenty of reason for people other than collectors to be interested in it. For a start, the M15 key layout once again gives you decent access to the cursor keys and their northward colleagues. You get a standard inverted-T cursor key block on each side of the 'board - nestled in next to each shift key - and Insert and Home and so on are in the top right corner, with the less-used Print Screen/Scroll Lock/Pause triplet above F10 to F12. You don't get a numeric keypad, or any blue-printing way to access its functions, and the Controls and Alts have shrunk into normal sized keys on either side of the split space bar. But you do get Num/Caps/Scroll Lock LEDs, above the left half of the function key row. And you get a standard Model M Enter key, and nothing else has been shuffled around. This key arrangement, plus the split, makes the M15 marginally less wide than the space saver Model M. It weighs a mere 1.54 kilos (3.4 pounds). Never mind all that, though. Check out this hinge. The hinge is a ball arrangement with a screw-down knob on top. Tighten the knob and the hinge locks, loosen it and you can flop the keyboard around as you like. The hinge gives two degrees of freedom, so you can pick the amount of yaw and roll you want your keyboard halves to have. The hinge bends up to 90 degrees downward, so you can make the keyboard flap like a moth if you're bored. The cable's permanently attached. There's a spare 12-contact socket on the back of one half of the 13H6689, but I don't know what it's for. Perhaps a numeric keypad. The back of the other half of the keyboard has a little recessed switch on it. That controls the "Erase-Eaze" function, which is what the cryptic little glyph on the left half of the split space bar is about. With the Erase-Eaze switch in the off position (there's a sticker on the underside of the keyboard that tells you which way is which), both halves of the space bar work as a boring old space bar. With the switch turned on, the keyboard's in Erase-Eaze Mode A, in which the right half of the space bar gives you a space, while the left half is now backspace. If you don't like that, press and hold the left Shift, Ctrl and Alt keys and you get Mode B, which swaps the backspace and space functions to the opposite halves of the space bar. Do the three-key press again, and you get Mode C, which is the same as having Erase-Eaze turned off. I'm not sure how useful Erase-Eaze is, but it doesn't hurt to have the option. It might be neat for playing games, too, since it lets you bind a different command to the two biggest keys on the keyboard. Note also that that the M15's cable doesn't just go into the keyboard at one point. It also loops from one half of the keyboard to the other. ...you can completely detach one half of the M15 from the other. This lets you move the keyboard halves more than a foot apart. It'd be an easy soldering job to extend the cable even further, but even as it stands it lets you set the keyboard up on two separate arm-rests of a chair, or on opposite sides of your body for use on your solar recumbent wireless Internet nerd-bike, or whatever. The M15 has three fold-out feet per half, with one conventional stick-on rubber foot on the outside corner (and another one next to the folding foot on the front edge of the 'board, in case you want to leave that foot up and tilt the keyboard in a more conventional way). Practically every keyboard in the world has fold-out feet, and some of them even let you set the feet to two different heights, but the M15 takes foot adjustment to a whole new, um, level, as you can see in the above picture. Each of the folding feet is, you see, actually composed of two main pieces. The larger piece gives you around a 3.4cm (1.3 inch) lift for that corner of the keyboard, but if you fold it out and then fold it back in again the smaller piece stays out, giving about an 18mm (0.7 inch) lift. And, as if that weren't enough, the actual rubber buffer on the end of each of the larger foot pieces isn't just stuck in place. It's on the end of a screw, and you can turn it to extend the foot even further, up to a maximum of about 56mm (2.2 inches). All of this put together makes the M15 a definite candidate for World's Most Position-Adjustable Computer Keyboard. It doesn't give you the sculpted typing surface of something like a Kinesis contoured 'board, and any position that relies on the hinge being locked for it to stay in place won't work too well since you can only crank the knob down so hard, but you can still arrange those two flat keyboard halves pretty much any way you like. And if someone who doesn't dig weird keyboards has to use an M15, it's no big deal to twiddle, click and bend it back into an almost normal layout. The only thing wrong with the M15 is, of course, that you can't bleeding buy one. Clicky Keyboards might still have one unit in stock, if they hadn't sent this one to me. Feel free to check out Clicky Keyboards' page for the M15; by the time you read this, they may have scared up a few more units. Apart from that, though, you just have to search and see what links are still live. M15s occasionally show up among the less exciting IBM keyboards on eBay, and a few years ago there was a Chinese seller who claimed to have ten thousand of them in stock for $US100 each, but would only sell them in lots of 30 or more. 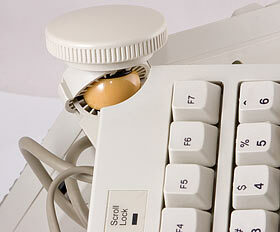 If you're shopping for a buckling spring oddity, Clicky Keyboards should be your first port of call. They may have what you want for a reasonable price, but even if they don't, browsing through their pages and pages of "SOLD" keyboards will probably clue you in to the model numbers of keyboards equivalent to the one you want. Then you can hunt for those models elsewhere. 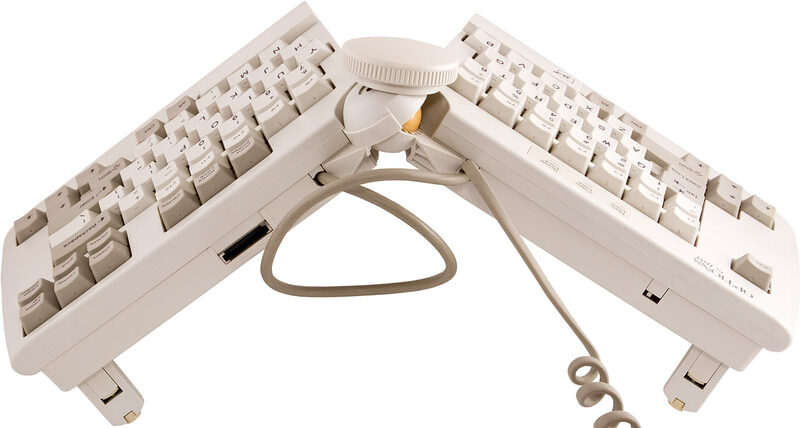 If you type a lot, and you've never used a buckling spring keyboard, then a Model M may well turn out to be exactly what you've always wanted. As I mentioned above, Clicky Keyboards aren't necessarily the best source for plain vanilla Model Ms. Unicomp have plenty of brand new ones for sale, and cheap used ones show up on eBay all the time. They usually only need a clean, not repairs. Note that if you're not a dedicated follower of buckling spring then you'll probably be just as happy, if not happier, with some Alps-switch 'board or other. You also don't have to pay a huge amount to get one or another programmable clicky keyboard; they don't let you set up any macros that you can't do easily enough in software these days, but they generally give you really nice extra keys to launch those macros. If you don't live in North America and you're not made of money, you should definitely check your local auction sites before you consider ordering one of the world's heavier keyboards from any dealer who's thousands of miles away from you. And, of course, if you don't type a lot then the whole thing's moot. I vaguely suspect that Clicky Keyboards are, just possibly, not be too keen on "cheaply-made 'disposable' replace-after-1-year keyboards with neon backlights, translucent jewel-colored plastics, mini LCD screens, shiny plastic, curvy shapes, extra dials, miniature buttons [and] wireless battery-eating features", but the fact remains that you can get a standard moderate quality 'board with a complement of not-very-useful extra buttons for $AU36.30 delivered, and such a keyboard will be quite good enough for the average computer user. Heck, the cheapness of rubber dome switches means you can get a low profile keyboard that lights up for the same price as a stack of a hundred CD-Rs. Or pay what used to be a normal quality-keyboard price for the kind of ludicrous eight hundred and six key 'board that gives the Clicky Keyboards dudes howling conniptions (but hey, it could be worse). If you want an integrated pointing device, a rubber dome keyboard with a touchpad also ain't expensive. But all of these keyboards, all of them, feel like typing on a dishcloth compared with any proper clicky 'board. If you type a lot, for any reason, you will be happier and quite possibly also healthier if you get a keyboard that lets you do it more effectively, and that very probably means one or another flavour of clicky 'board. People who use most vintage computer gear do so for reasons of nostalgia alone. If it still works at all, it's not going to be any less annoying to operate today than it was in 1982, and it's likely to be laughably inferior to what's available today. 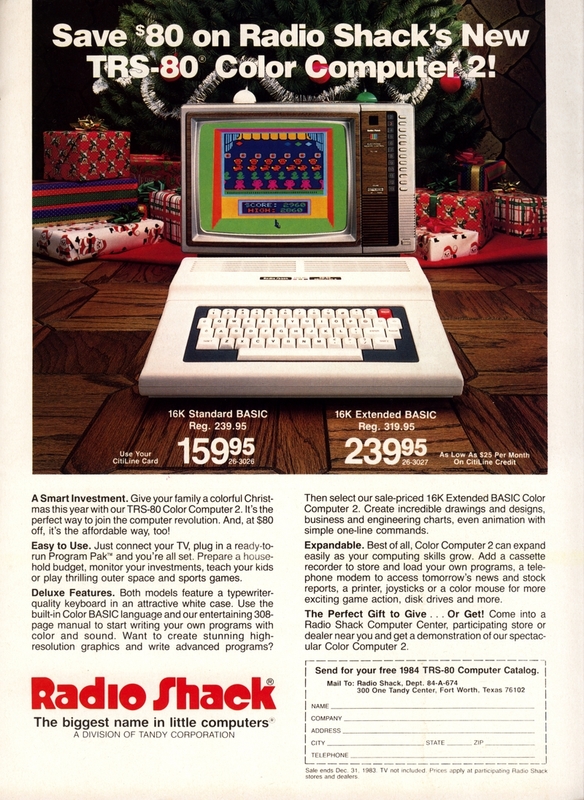 There's not much reason to revive a $5 Apple II when you can play all those old games on an emulator without once listening to a Disk II beating its brains out over a read error. Clicky keyboards are a very notable exception to this rule. They're genuinely better than the common modern equivalent, and even a very expensive one can be well worth every penny to a serious writer or programmer. Clicky Keyboards inform me that they've got a "continuously growing stockpile" of IBM 'boards of all vintages. It costs nothing to drop in and see what's on offer today. Review keyboards kindly provided by Clicky Keyboards. You can find a wide variety of IBM keyboards on eBay; if all you want is an ordinary Model M in good condition that's not so far away that shipping triples its price, there are often good deals to be had. Beware, however; some suspiciously cheap "model M" keyboards don't actually have clicky keyswitches. 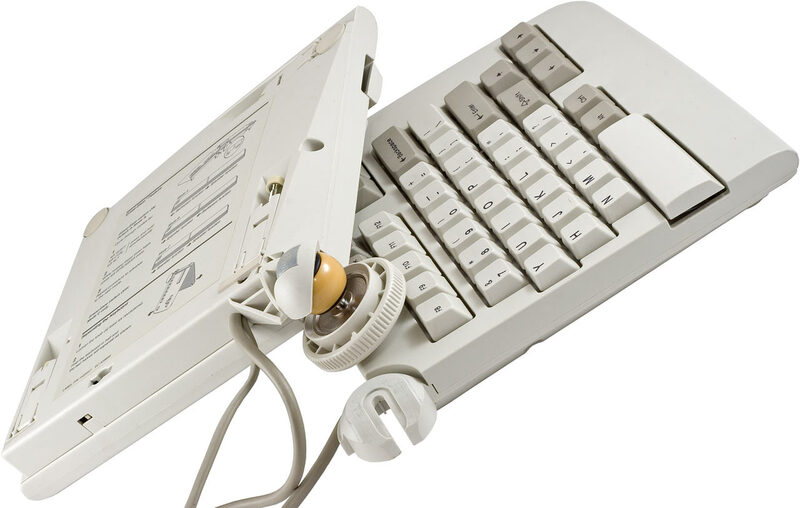 Also, "terminal" keyboards with some kind of registered jack or other non-PC connector are unlikely to be usable with a PC at all. If it's got clicky switches and an AT or PS/2 plug, though, you're in business. Keyboards like this sell for less than $30 including US delivery all the time. Here's my 1999 piece about IBM keyboards.